This European-influenced home has Craftsman flair. The kitchen and dining room are open for conversation flow, with an octagonal tray ceiling and bay window adding drama to the dining space. The split bedroom layout has a stunning master suite set apart from three bedrooms with two full bathrooms. A bedroom/study just off the foyer is the perfect home office or guest room. An e-space, walk-in pantry, and a large utility room provide storage and workspace, and the three car garage is oversized to accommodate extended wheelbase trucks. 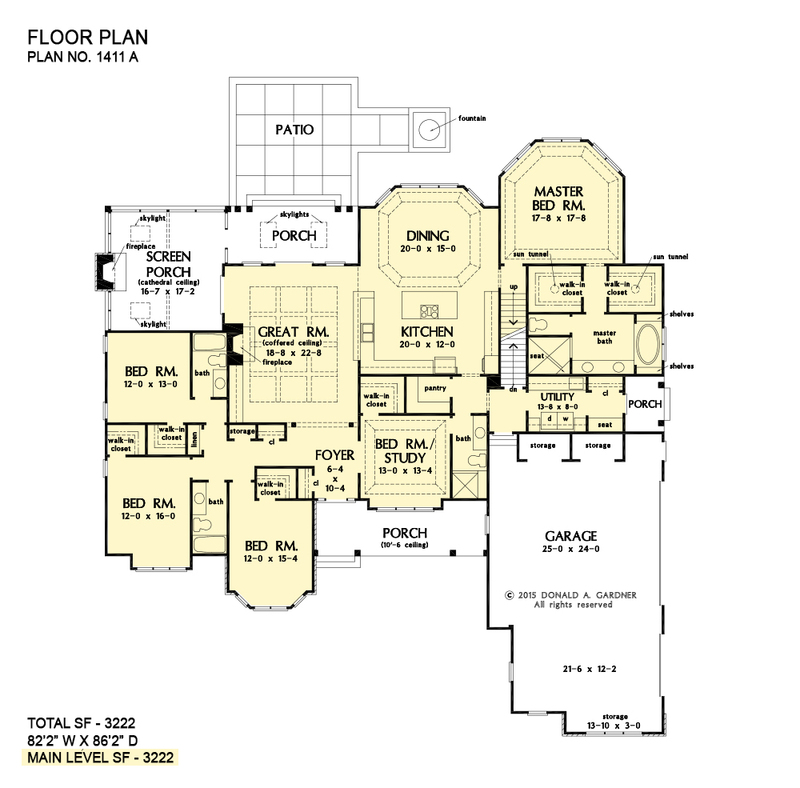 1st Floor: 3222 Sq. Ft. 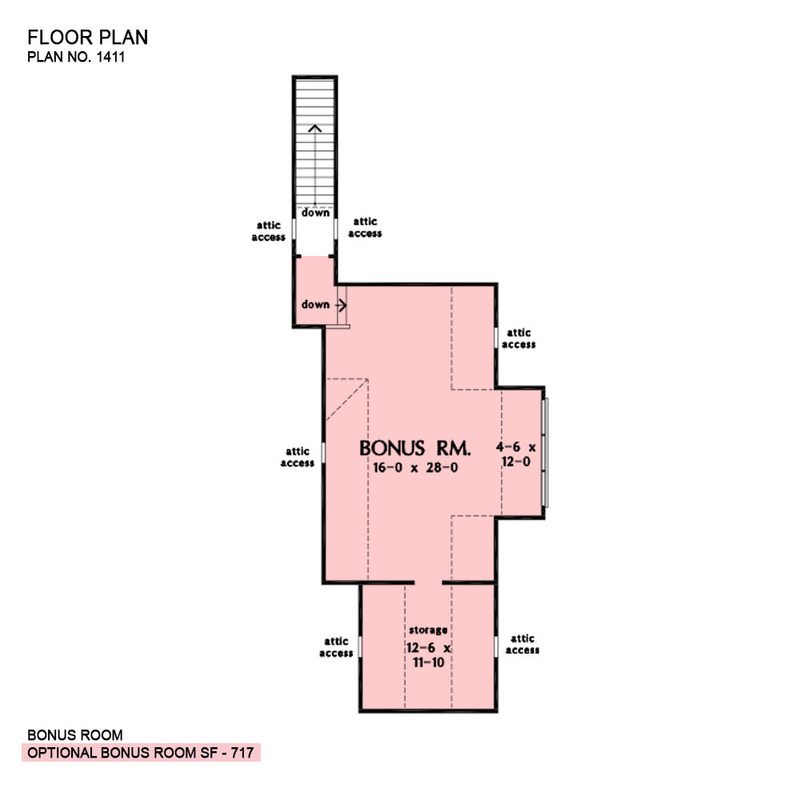 Bonus Room: 717 Sq. Ft.
Porch - Screened: 321 Sq. Ft.
House Dimensions: 82' 2" x 86' 2"
Great Room: 18' 8" x 22' 8"
Master Bedroom: 17' 8" x 17' 8"
Foyer (Flat): 6' 4" x 10' 4" x 9' 0"
Dining Room (Tray): 20' 0" x 15' 0" x 10' 6"
Great Room (Coffered): 18' 8" x 22' 8" x 11' 0"
Kitchen (Flat): 20' 0" x 12' 0" x 9' 0"
Utility Room (Flat): 13' 8" x 8' 0" x 9' 0"
Bonus Room (Clipped): 16' 0" x 28' 0" x 9' 0"
Garage (Flat): 25' 0" x 24' 0" x 0' 0"
Garage Storage (Flat): 7' 4" x 3' 8" x 0' 0"
Master Bedroom (Tray): 17' 8" x 17' 8" x 10' 6"
Bedroom / Study (Tray): 13' 0" x 13' 4" x 10' 6"
Bedroom #2 (Flat): 12' 0" x 13' 0" x 9' 0"
Bedroom #3 (Flat): 12' 0" x 16' 0" x 9' 0"
Bedroom #4 (Flat): 12' 0" x 15' 4" x 9' 0"
Porch - Front (Flat): 25' 0" x 8' 0" x 10' 6"
Porch - Rear (Flat): 18' 11" x 8' 4" x 9' 0"
Porch - Right (Flat): 5' 8" x 8' 0" x 9' 0"
Deck / Patio (None): 18' 8" x 18' 8" x 0' 0"
Porch - Screen (Cathedral): 16' 7" x 17' 2" x 18' 6"
Storage (Other) (Flat): 7' 4" x 3' 8" x 0' 0"
Garage Storage Bay (Flat): 13' 10" x 3' 0" x 0' 0"
E-Space (Flat): 5' 4" x 8' 0" x 9' 0"
Storage (Bonus) (Clipped): 12' 6" x 11' 10" x 9' 0"
Storage (1st Fl.) (Flat): 3' 10" x 2' 0" x 9' 0"